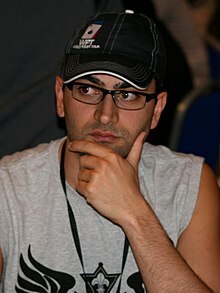 Antonio "The Magician" Esfandiari, born Amir Esfandiary (Persian: Ø§Ù…ÛŒØ± Ø§Ø³ÙÙ†Ø¯ÛŒØ§Ø±ÛŒ‬‎; December 8, 1978), is a professional poker player and former professional magician, known for his elaborate chip tricks. Esfandiari was the face of the now-defunct poker site, Ultimate Poker. In addition to appearing on several poker television shows, he has won two World Poker Tour (WPT) championships and three World Series of Poker (WSOP) bracelets in his career, including the "Big One for One Drop" in 2012, a $1,000,000 buy-in tournament benefiting the One Drop Foundation.